My introduction to The the was when Jake and I drove across Michigan—from Grand Rapids to Kalamazoo to Detroit—to see them. I went simply because Johnny Marr was in the band. I was heavy into all things Marr then and since he was in the band for The the Vs. The World Tour 1990 then I was willing to do it despite never having heard a word or note of the music. That’s what young musical obsessions are all about. Memories of the show still stir my soul. When the whale songs that made for warm-up music faded out (yes, whale songs) the Royal Oak Theater began to shake as Matt Johnson called out from off stage, “This is a dance band!” As a dedicated fan of The Smiths I have to admit I was a bit horrified by that declaration. But his meaning soon became clear: you will NOT be seated for this show. I don’t remember the setlist anymore or even how many songs from Mind Bomb they played but one moment is forever imprinted in my mind and remains the standard against which all other live musical experiences are held. “Good Morning Beautiful” almost literally took the house down. Yes, it was loud and it’s a song that employs tones that border on The Brown Sound, but more than that it was riveting and a bit shocking. I felt as if the music had pinned me to the wall. My attention was had. And so it’s only right that “Good Morning Beautiful” opens The the’s best album and the one that made me want to be a “serious” guitarist (if only for a moment). As I transitioned into my 20s and America was not yet transitioning into the Clinton years, it was a heavy album that verified my paranoia and justified my indignation while still catering to my obsession with British bands and, more importantly, Johnny Marr. See what I’m saying? As a Midwestern kid who grew up steps away from the Christian Reform Church HQ this was heady stuff. But even when Matt Johnson is laying down his heavy hand there is a melody and pop sensibility and sensitivity that keeps the album from veering off into Queensryche material. More importantly though was the fact that I was suffering from a broken heart. In that state nearly everything takes on more significant meaning. My girlfriend had rekindled our relationship at the end of the summer only to once again break it off early that fall putting “August & September” into sharp focus for me. My friends were going off to college and meeting people who did not attend our conservative little high school in the middle of a corn field. They had parents who voted for Carter (and McGovern and even McCarthy!) and they could talk about politics from a different angle. They thought about the world beyond their stifled downtowns. I did not and could not, but I had an interest. Matt Johnson became a surrogate parent for me to learn about geo-politics. “Armageddon Days Are Here (again)” prefaced the Iraq War I. “The Violence of Truth” challenged me to consider the sources of information I’d been given. “The Beat(en) Generation” took on the Baby Boomers with a bit more sympathy and style than most of the spitting punk anthems of a decade before. These were thoughtful statements, if not fully thought out. They were enough to get me thinking, and isn’t that really the point? The inside jacket gives listeners directions to obtain maximum pleasure and effect: “Please play very loud! Very Late. Very alone…and with the lights turned very low.” I think it’s sound advice and can assure that I followed these directions religiously, repeatedly. Matt Johnson still has my attention. Previous PostNew MGMT video: It’s WorkingNext PostMadonna v. Gaga: Who Are You? These seemed like great records at the time, I would argue that they have aged very poorly. Obviously, (since I am calling it a lost classic) I disagree. Glad to see you bring this up, Phil. I still listen to this album often. It’s one of the great albums of my frosh year of college. Way underrated. I’m gonna meet Bob and Derek halfway: the songs still stand up but the production has not aged well. See, I still think it sounds great. It’s big, it’s bombastic–yes. But is it so bad to have a little ambition in your music? Must we all be so lo-fi? Still one of my all time favorite records. I pull that disc out half a dozen times per year and never get sick of it. I’ve only ever heard it in analog low fi, though. I remember that Detroit show and kick myself for having missed it! I think the album holds up amazingly well today. Much better than many of The The’s contemporaries (The Smiths excluded). I think the production on this album is perfect for the songs. Mind Bomb sounds a lot better than Infected, which tends to be more highly regarded among rockcrit types (they’re wrong). The drums sound big and natural and the guitars sound perfect. I’m very curious what specifically about the production people aren’t happy with? As long as it’s not used as a gimmick, I don’t care if a record is lo-fi or full-on 72 track, panoramic production. Then again, I enjoyed Bee Thousand and the like, but when GbV made the transition from 4 track to proper studios, not only did I did not complain–I actually rejoiced. I’m with you, Derek: what’s wrong with “a little ambition in your music?” When Everybody Loves a Happy Ending was released, I remember thinking–particularly for a 21st century album–“Wow, they sure don’t make records like this anymore.” Stellar, ambitious production on that TFFs record. But it’s not a question of bombastic or not. I mean, Back in Black, for example, is not an ’80s record per se, but one that happened to be made during that decade. I think the production on Mind Bomb is dated; it screams ’80s. For one thing, that extra dollop of unnecessary reverb that mars the enjoyment of plenty of ’80s records is present on Mind Bomb. (The way some instruments were recorded and some of the sounds used are culprits, as well.) Fortunately, it’s not as bad as others and the quality of the songs definitely help one overlook this. Curiously, Mind Bomb does remind me of “Jet City Woman”-era Queensryche, not musically, of course, but in terms of that super sleek production that now comes across quite heavy-handed. 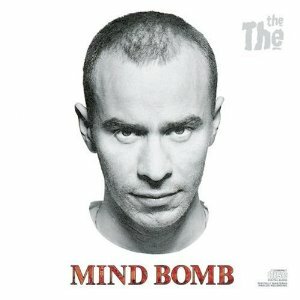 I need to revisit Mind Bomb. Thanks for the eloquent reminder. In high school, I spent weekends crate digging in long-gone 2nd hand music stores; I’ll never forget the moment I found a 12″ import of Uncertain Smile. Man, I listened to that track hundreds of times–Jools Hollands’ piano solo is one of my favorites. Great album that precluded great music to follow. It’s the damn drums. They just forgot how to record drums in the 80’s. There is also something about how almost everything from that period was mastered that kinda sucked too. I’ll admit I still have an original cd issue of this. Maybe newer, remastered versions would sound good to me. I’m doubtful though. Um, for the most part, yeah. Hands down Goodmorning Beautiful is one of the best The The songs ever. I was very disappointed that he did not perform it for the comeback tour, but understood why. As for the recording, that is simply the fault of the age. When analog and digital we’re fighting it out. We know better now, analog is supreme! But considering that Matt Johnson is as much a recording engineer as he is a musician, I was always surprised that the original recording came out as it did. You guys are so spoiled with your moaning about sound quality. Good music is good and timeless. Overlook production values and just enjoy brilliant lyrics and great music. Shee lucky you weentwe born in the 60s, you never would have listened to the stones or beac boys ? You must be new here. Hi!